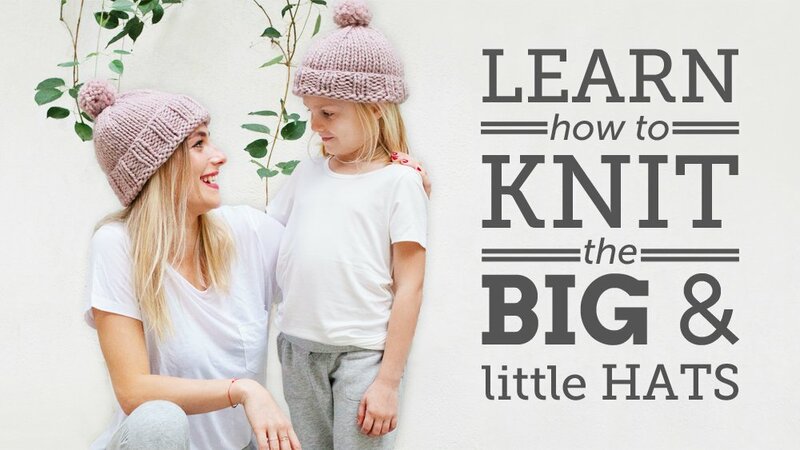 The Big and Little Hats are a pair of sweet matching hats for an adult, toddler and baby. They’re simple, fluffy, warm and great for a beginner knitter. Knit with thick, bulky yarn, each hat is completed in no time at all! The Big Hat is sized for adults and fits an average-sized woman’s head. The Little Hat is sized to fit a toddler (For reference, Kate, who is pictured wearing the Little Hat, is six-years-old). Because we couldn’t leave out apple-cheeked babes, we decided last minute to design a baby size. Though not pictured, it’s totally adorable and looks like a mini version of the Little Hat. We call it the Littlest Hat! In order to knit this pattern, you should be familiar with how to knit. Need a refresher? Check out How to Knit and come back when you’re ready. To watch the pattern tutorial, enter the password found on the first page of your pattern. Don’t have the pattern? Head to the shop, grab the pattern and join the fun. See you inside! Is this pattern released yet? Hey Zahra, We’re in the middle of a site re-design where the shop will be updated with new yarn, knitting kits and new patterns, including this one! If you’re interested in checking out these patterns *before* they hit the shop, just shoot me an email at [email protected] and I can send you a catalogue. A number of people have been purchasing these unreleased patterns this way. Otherwise, just hold tight! New patterns will be appearing very soon in the shop! The raglan has been delayed to make way for these new patterns. Just finished knitting the big hat and loved it! I plan to start the baby and kid size ones soon. But was just wondering if I need to block the hats after finishing? I am using lion brand thick and quick. Also, the yarn says it’s machine washable but if I want to wash it, will that ruin the pom pom? Thanks so much for your help. Love your tutorials, they are great for beginners like me! Hey SG! Sorry for the late reply. You don’t have to block the hats if you’re happy with how they look after you cast off. It’s up to you entirely! If I remember correctly, the Thick and Quick is an acrylic blend, so it should do fine in the washer. However, pom poms tend to get a bit raggedy in the wash, especially if the yarn is a one-ply. If you’re worried, you can remove the pom pom first, wash the hat, and then reattach the pom. If that sounds like too much work, you can consider handwashing the hat instead of using the washer. Handwashing is gentle enough for the pom that it shouldn’t alter it very much at all. Hope that helps!